GENERAL PURPOSE CLEANING: (Kitchen counters, floors, bathrooms, etc.) Dilute 2 oz of Chemco Orange with 1 gallon of water. Adjust concentration depending on desired task. 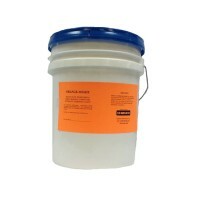 ALL PURPOSE DEGREASING: (Concrete floors, grills and hoods, machinery, etc.) Spray or spnonge on, allow to stand 2 to 4 minutes before rinsing with clear water. RUG AND UPHOLSTERY SPOT REMOVAL: To remove oil and grease, pour Chemco Orange on sponge or cloth. If spot remains, repeat process. To remove chewing gum, blot Chemco Orange on gum and let stand for 2 minutes. Use a tongue depressor or the dull edge of a knife to scrape off. It is always best to test Chemco Orange on an inconspicuous area before applying. CITRUS SCENTED ODOR CONTROL: SPACE SPRAY - Spray mist into air to help control malodors. SURFACE SPRAY - Spray to lightly wet source of maldodor. TILE & TUBING - Sponge, mop or brush on surface. Let Stand 2 to 3 minutes. Agitate and rinse with clear water. 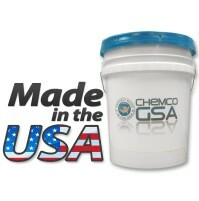 DRAIN LINE MAINTAINER: Chemco Orange deodorizes and liquifies grease and scum which cause clogging. Add 3 to 4 ounces to each drain and let stand 5 to 10 minutes, then flush with hot water. If not completely cleared, repeat. The same procedure is used for bathroom sinks and tubs. SHOWER, TUB SCUM REMOVAL: Ideal for removing soap film encrustation on walls of shower and tub. Apply with sponge, allow to stand 1 to 2 minutes. Agitate if necessary. 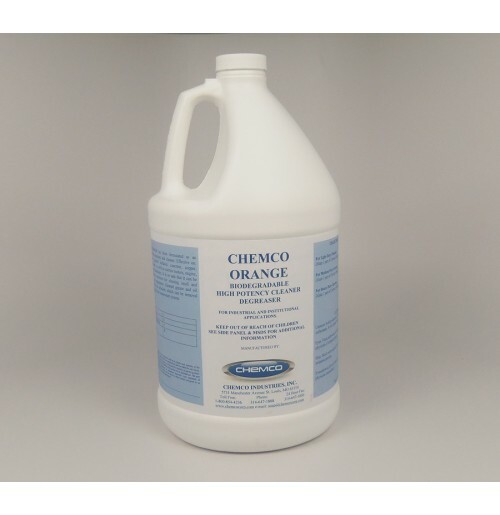 PET ODOR CONTROL: For indoor use, dilute 1 ounce of Chemco Orange with 1 gallon of cold water. Apply through a sprayer to odor source. For outdoor use, dilute 2 ounces of Chemco Orange with 1 gallon of cold water and follow same procedure. Do not use directly on pets. REMOVES STAINS FROM NATURAL FIBER CLOTHING: To remove oil, grease and food stains from clothing, pour Chemco Orange on cloth and apply to soiled area. Wash with detergent as usual. If spot remains, repeat process. Always test an inconspicuous area of clothing before applying. GREASE TRAPS: For traps under 2 cu. ft. capacity, pour or pump 5 ounces daily into grease trap. For larger traps add 8 to 10 ounces daily. ENGINE & MOTOR DEGREASING: Brush or spray concentrate on surface level to be cleaned. Allow 3 to 5 minutes to soak in. Rinse with hot water or steam off. TIRE MARK REMOVAL: Apply with mop, sprayer, or brush. Allow to stand 1 to 2 minutes. For best results, agitate the are while Chemco Orange is penetrating. Hose off with water and squeegee or vacuum dry. TAR AND ASPHALT REMOVAL: To emulsify tar, asphalt, bitumen and asphalt-based plastic cement, apply undiluted to the soiled surface by spraying, mopping, or pouring. Allow to stand 2 to 4 minutes for deep penetration. Agitate if necessary. Rinse with water, preferably under pressure. BUMPER STICKER & DECAL REMOVER: Pour Chemco Orange on cloth and apply to area being cleaning. Rub until adhesive is removed. GARBAGE TRUCKS & DUMPSTER CLEANING/DEGREASING: Mix 1 gallon of Chemco Orange with 20 gallons of warm water. Spray the solution on surface to be cleaned or degreased. Let stand for 2 to 3 minutes. If necessary, agitate with brush, then hose off with water. REMOVE STAINS FROM CONCRETE: Remove oil stains from concrete driveways. Pour Chemco Orangee directly on stain. Allow 3 to 5 minutes to dissolve stain. Rinse off. TRY CHEMCO ORANGE ON THESE ITEMS TOO: Scuff marks, putty, kitchen grease, duplicator ink, rubber cement, asphalt, crayon marks, fresh paint, spray adhesive, waxes, creosote.